Good chili results not so much from what you put in it as what you don't put in it. Day in and day out here at Texas Cooking, Texas-style chili gets more than its share of attention. Everyone loves chili and wants to be able to turn out their very own pot of delicious chili when the occasion demands. As we all know, chili seems to have originated in south Texas as a peasant food, and then as the first fast food in the Military Plaza in San Antonio under the management of the "Chili Queens". 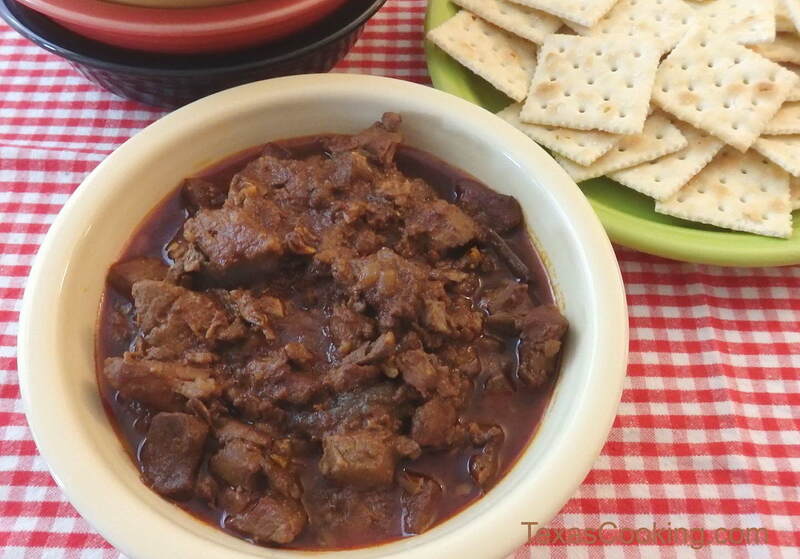 Chili is a simple dish of meat seasoned with chile and comino. Of course, other seasonings are included, but these two are the main flavoring agents. Uncountable recipes have evolved from the first one. Just about every seasoning and method of stewing has been tried but the old faithful original recipe seems to get the most votes for best. Here is my standard recipe. In a heavy skillet, saute the meat in a small amount of oil or shortening until it is gray and gives up its juices. Transfer the meat to a stew pot and discard the juices. While the meat is still hot, mix in the onion and garlic, salt and black pepper to taste. Cover and let set for 30 minutes. Add enough water to cover the meat. Put in the spices and bring to a simmer. Cook until the meat is tender. You may have to add more water if the mix becomes too dry. Add the tomato sauce and simmer another 20 minutes. If the chili is not spicy enough for your taste, add a small amount of cayenne. Mix 2 tablespoons flour with one half cup of water. Raise the heat under the chili until you get a good boil. Stir in the flour/water mixture and continue stirring until mixture thickens. Reduce heat and simmer about 15 more minutes. Serve with saltines or tortillas. The above recipe will make a good pot of chili every time. There are a couple of things that can be changed when you start experimenting with developing your very own best chili recipe. At the risk of being stoned in the town square, I say that changing the meat from all cubes to a mix of grind, cubes and hamburger works real well. The ratio would be about one part "chili grind", one-half part cubes and one-half part hamburger fine grind. This will give what I think is a better texture to the finished product. Your butcher can make the "chili grind" for you. It is just a coarse grind of the meat. Be careful with the hamburger so that you don't get a lot of fat in the meat. It would be best to get custom grind with nothing white in it. Chili does not have to be greasy. The next thing to work on is getting some flavor in the meat and not merely having roast beef in chili gravy. For me, steeping the sautéed meat with the onion, garlic, jalape˜o and salt and pepper gets a good flavor in the meat. One of our better chili cook-off competitors used some jalape˜o sauce in the pan with the meat as it was sautéed. This seems to impart a really good jalape˜o taste to the end product. The onion should be a white one. I just think they have better flavor. Sometimes the yellow ones are a bit sharp, and the purple or red onions give an odd appearance to the chili, and they are really too sweet. The garlic needs to be firm and not growing in the hand. Mince it just as fine as you can. The jalape˜o should have the seeds and veins removed before mincing. (Here is one of my secrets: I put the onion, garlic and jalape˜o in the blender and reduce it to purée. That way you don't get any lumps of vegetable floating in your chili). Salt is salt. Just don't put in a whole bunch during the cooking stage. Make your final adjustments after the pot is done. Black pepper should be fine grind for this application. A lot of the better chili chefs on the contest circuit use some white pepper in their pot. Now white pepper is nothing but black pepper with the black scraped off, but the bite is different for some reason. The black pepper has more of a "back bite". That means it takes a few seconds for you to feel the pepper on your taste buds. The white pepper is "front bite", which means you taste it right away. A little front bite is good. Cayenne is a way back bite. It seems like you can swallow before the bite kicks in, which is also good. Comino is usually used in the form of powder, which is called cumin or ground cumin. Some folk use the whole seed but not many. To really get the flavor from the comino you need to process your own on cooking day. You put some comino seeds in a dry skillet and toast them just until you can smell them. Then you powder them in a spice grinder or some such. The ratio of comino or cumin to the chili powder is about three to one in favor of the chili powder. In other words, three tablespoons of chili powder requires one tablespoon of cumin. If you use the blended chili powder, the ratio does not necessarily change. The blend contains cumin, but it dies out with age and may not be strong enough to even taste in the blend. You need the cumin fresh. A tad of oregano is good in chili. Use the Mexican variety, if you can get it, and just use a tiny bit as it is very potent. Some use a pinch of basil also. This is where individual taste comes in. Do what is best for you. If you absorb this information and read the rest of my chili articles in the archives, I guarantee you will know more about chili than nearly any man or woman on the street. Good chili results not so much from what you put in it as what you don't put in it. Good chili contains no arrowroot, anise, aspirin or arrowheads. Also no chocolate, sour cream or flax seed. Leave out rawhide doggie chews and empty cans. No seafood allowed. We don't want to see any whole Jap peppers floating in a sea of red grease either. You know what to do; just do it.